Free collection of digital images for testing. The TESTIMAGES archive is a huge and free collection of sample images designed for analysis and quality assessment of different kinds of displays (i.e. monitors, televisions and digital cinema projectors) and image processing techniques. 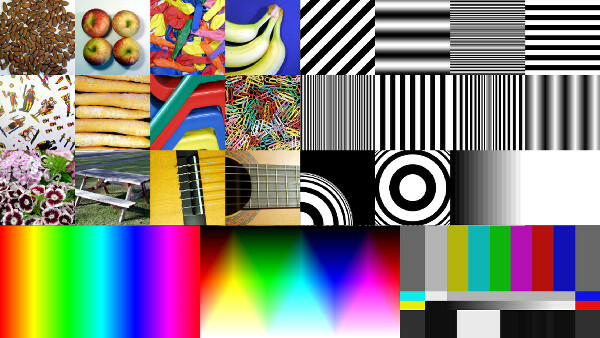 The archive includes more than 2 million images originally acquired and divided in three different categories: SAMPLING and SAMPLING_PATTERNS (aimed at testing resampling algorithms), COLOR (aimed at testing color rendering on different displays) and PATTERNS (aimed at testing the rendering of standard geometrical patterns). ASUNI N, GIACHETTI A, "TESTIMAGES: a large-scale archive for testing visual devices and basic image processing algorithms", STAG - Smart Tools & Apps for Graphics Conference, 2014. Please note that since the original publication the SAMPLING and SAMPLING_PATTERNS archives where updated to start from the 2400 pixels resolution instead of 1200 pixels. To avoid common issues related to the use of images with unknown origin or protected by restrictive copyright or license, all the images in the TESTIMAGES archive are copyrighted by Nicola Asuni and distributed under the Creative Commons license "Attribution-NonCommercial-ShareAlike 4.0 International" (CC BY-NC-SA 4.0). All images were generated using a range of custom Octave/MATLAB software scripts specifically written for this purpose to guarantee the precise positioning and value of every pixel. The same image is generally available in 8bpp and 16bpp (bit-per-pixel or bit-dept) in 3-Channel Red-Green-Blue (RGB) and 1-Channel Grayscale format. The 8bpp images were always generated by their 16bpp counterparts by normalizing the intensity values. The images were saved using the patent-free Portable Network Graphics (PNG) format and optimized using OptiPNG. In the PATTERNS dataset, to achieve a good quality anti-aliasing effect, the intensity value of the pixels is always proportional to the portion of the pixel covered by the maximum intensity surface. The images are generally organized in folders and subfolders, where every folder indicates one common feature of the contained images (i.e. bit-depth, number of channels, resolution). Due to the large size of the archive, the images are aggregated for common features and compressed using bzip2. [EX] : extra information used to identify the specific image, as described in the later chapters. This common pattern makes it easy to select images with specific charateristics. In the documentation we will only refer to the [EX] portion of the file name.